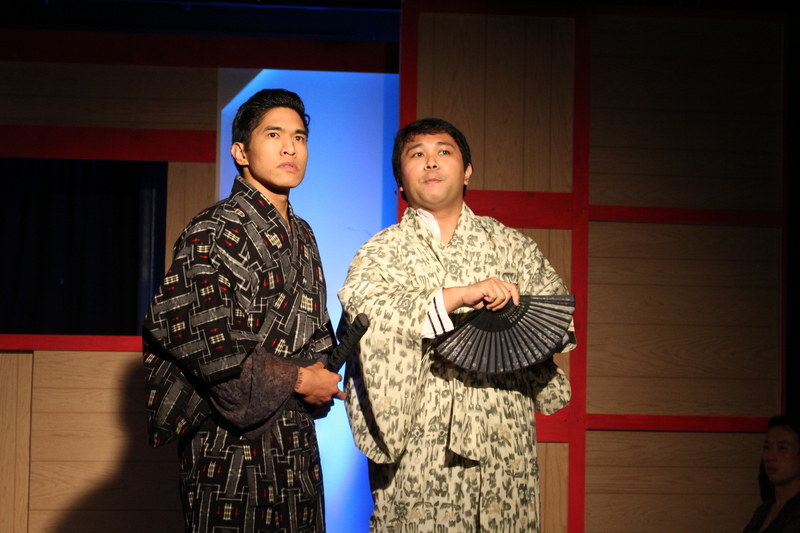 The original 1976 Broadway production of Pacific Overtures, which ran for only 193 performances, was not considered a success. Playwright John Weidman and composer/lyricist Stephen Sondheim chose a very unlikely story—the opening of the Floating Kingdom of Nippon (Japan) in 1853 by U.S. Commodore Matthew Perry and the resultant culture shock on both sides. 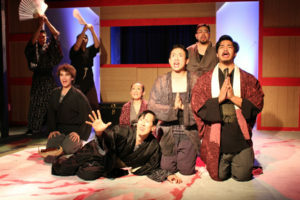 Director Harold Prince staged the show in the Japanese Kabuki style with a nearly all-male Asian cast. To say it was ahead of its time would be greatly understating the fact. Luckily LACLO impresario Edwin Lester arranged to bring the original production and cast to his subscribers in Los Angeles and San Francisco later that year. The show was nominated for 10 Tony Awards but in the year of A Chorus Line and Chicago, it only was awarded two. The show’s star, Mako, was one of the founders of East West Players and in 1979 directed and reprised his role as The Reciter in the tiny confines of the group’s Santa Monica Blvd. theatre in Silverlake. The intimate production was one of the year’s biggest success stories, enjoying a lengthy run. A Broadway revival by the Roundabout Theatre Company in 2004 lasted only 69 performances. Chromolume Theatre is currently presenting a scaled down version in their 49 seat space on Washington Blvd. The original Broadway production’s two Tony Award wins were for the dazzling sets by Boris Aronson and colorful costumes by Florence Klotz. 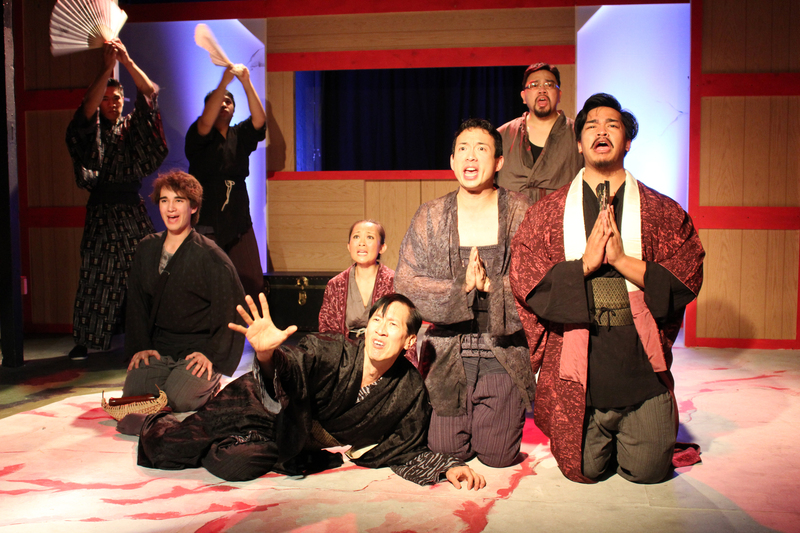 Don’t expect much from Chromolume’s bare bones production which basically comes across like a staged concert version featuring nine men and one woman in kimonos and ninja tabi socks. The voices are better heard as a group than in solo moments, yet the intimacy of the space provides you with a crystal clear hearing of one of Sondheim’s best scores. You would think the melodies are original Japanese tunes they so fit the character of the piece. His lyrics are graceful, economical and at times very satirical. Highlights include the heartbreaking “There Is No Other Way,” sung in alternate verses by Daniel Koh and Gibran Mahmud, and the bantering of Cesar Cipriano and Daryl Leonardo in “Poems.” Cipriano brings the right gravity to his role of the lowly Kayama who is quickly elevated to Governor and made to deal with the foreign invaders. His Act Two “A Bowler Hat” beautifully assays his conflicted emotions as he becomes Westernized like the rest of his country. Leonardo makes a lightweight Manjiro, a Japanese fisherman who has experienced America and returns to warn his native land of the Perry expedition. Paul Wong gives a lackluster performance as The Reciter, a role that should dominate the proceedings as it functions as both Narrator and Outside Commenter. Musical director Daniel Yokomizo leads the three-piece band and gives the score the proper Japanese flavor. James Esposito may have a passion for this show but his direction often mutes the material rather than showcasing it. He never gives a clear reading to the kabuki style of the material. Therefore numbers such as “Chrysanthemum Tea” and “Welcome to Kanagawa” lose their impact because Peter Jeensalute as the Shogun’s Mother and Daniel Koh as the Madam with her in-training geisha girls come across more as drag acts than they should. He crowds the small stage with the cast during Kevin Matsumoto’s “Lion Dance” which negates the joyous exhilaration of Commodore Perry’s successful conclusion to his mission. He also has all the Admirals on stage at the beginning of the Gilbert & Sullivan themed “Please Hello” number which misses the recurring joke of the song. Marcel Licera, John Sala and Julia May Wong, each playing multiple roles, complete the cast. Even with its faults, I was glad to have seen this gem of a show again since it has not been seen in L.A. in 19 years. 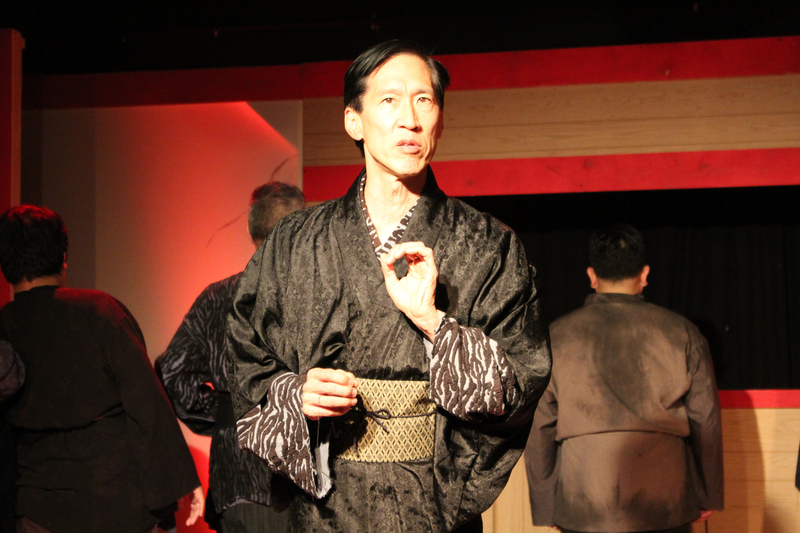 If you have never seen a production of Pacific Overtures and need to cross it off your Sondheim bucket list, you should see it in this intimate venue. It might be another 19 years before you have another chance. Chromolume Theatre, 5429 W. Washington Blvd. in Los Angeles. Ends Dec. 23. www.crtheatre.com.